Russian people do not stop doing activities although the winter has come. After embracing fall, they start doing activities in winter. As you know, Russian is the nearest country to the north pole. This makes Russia has so many cold territories, especially in winter. However, there is no stopping Russian from doing fun activities. There are so many activities that Russian people usually do although in the cold winter. The activities, of course, include ice skating on the top of frozen Lake Baikal. So, here are 7 things Russian folk likes to do in winter time. Lake Baikal is in remote Siberia. Those who leave near the area usually enjoy winter on the lake. There are so many activities to do there. They can do skating, skiing, dog sleighing or fishing trips. There is no need to worry as the ice that covers the lake is firm. Moreover, there are not so many people will be around. So, whoever come to have a pleasant trip to the lake will feel like owning the place. Besides, Russian people who come to the lake during winter definitely know that they cannot miss the white landscape that they cannot see it in anywhere else in Russia. You may also want to know about mysteries and myths surrounding Lake Baikal. Although visiting St. Petersburg is almost like being in any other cities in Russia, there is something different about it. In winter, the place offers so many beautiful frozen canals that make everyone who sees it melt. Moreover, it has the largest out ice-skating rink in the country. As you may know, the city has so many museums. Those museums also open in the season, including the Hermitage. There are also Yusupov Palace, Mikhailovsky Palace and St. Isaac’s Cathedral which are fun to see. Moreover, there is Mariinsky Theater that opens in the evening, even in winter. There, all people can watch Opera performance or Russian ballet. There are so many place to ice skate during winter in Russia, including Moscow. Muscovites go to VDNKH (read: vedeenkha) Park for ice-skating activity. It just takes 5 minutes from Red Square to reach the place. The park open daily from December to March from 10 a.m. up to midnight. People also go to Gorky Park to have similar activities. Russians usually go there bringing their own skate. However, there is also place to rent skate for those who don’t bring one. The place does not only for ice skaters. There are so many vendors surrounding the park to sell any foods and drinks that suit for winter. Those start from coffee to corn. While enjoying foods and drinks, they can enjoy the view of dazzling blue lights and glimmering gold from “fountain of people.” If the foods or drinks for the vendors are not satisfying, there are also some outdoor restaurants. Strolling between the snow-caped trees heading to the deep park is also a choice. If you think that street fairs will not take part in winter, you are dead wrong. In Moscow, the street fairs are everywhere, starting from Red square and Manezhnaya square. Thanks to Christmas. At night, the places are decorated with many lights and beautiful lanterns and trees. There are also some Christmas decoration, like reindeer The fairs mainly sell anything related to the Holiday. Those start from foods, drinks and unique handicraft for Christmas. After a long walk enjoying the street fair, it is the right time for Russian people to go to Bania. Bania is like Russian sauna. The sauna is not like any other sauna. It has its own Russian icon. The building itself has sculpture that there is nothing similar in any other part of the world. During sauna, people can have alcoholic drink, like vodka. They also have mixed bath with men and women. Among all Banias in Moscow, the most popular and the largest one is Sanduny. Some Russian celebrities and politicians usually go to the place regularly. There, they have besom session and a shot of vodka at the adjacent restaurant. Those are the mandatory activities for those who visit the place. Another indoor activity is that visiting the planetarium in Moscow. There Russians usually spend some time to enjoy several fascinating aspects of space. Those include dazzling night sky at the Large Star Hall, entertaining games, and an illustrated explanation of scientific theories and ideas of space at the Lunarium. What’s interesting is that all of illustration are available in English, Chinese, German, and Russian. Moreover, the place also present occasional music performance. What is the perfect time to enjoy a hockey match other than in winter? Muscovites usually go to CSKA Ice Palace to watch their favorite hockey team playing. 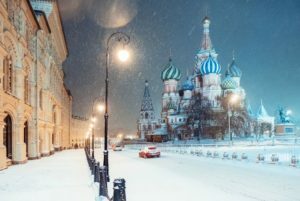 The place often holds matches between Moscow teams and other national teams in winter. During each match, they usually enjoy snack or meal at one of many restaurants and cafes inside the stadium. There are also some shops selling souvenirs related to hockey. Those are 7 things Russian folk likes to do in winter time.